Matsumoto Castle (松本城) is one of 12 Extant Original Castles built in 1593. It is Combined towers structure Tenshu which as 29.4m high from ground level. 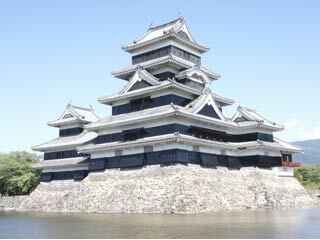 As 5 Layered 6 stories high Tenshi, Tenshu of Matsumoto Castle is the oldest which still exists. This castle is listed as the National Treasure of Japan, and chosen as the four best castle of Japan. Because it painted deep black, it is also known as Crow Castle. In side of the Tenshu, is exhibition area for Rifles and armors from Sengoku Period. Admission fee into the castle and museum : 600 yen for adult and 30 yen for kids. Open: 8:30am to 5pm, gate closed at 4:30 pm. Closed on New year’s Day.